EL PASO - The El Paso Chihuahuas unveiled their 2014 inaugural uniforms on Wednesday at the Judson F. Williams Convention Center that include five jersey variations: white, gray, black, red and the traditional pinstripe. The jerseys, made by Russell Athletic, feature Dri-Power technology that helps to keep the athlete's skin drier and more comfortable. "We are excited to unveil a bold, fun look for El Paso's team," said General Manager, Brad Taylor. "The combination of uniforms continue to offer something for all fans." The white jersey, considered the home jersey, features the Chihuahuas wordmark across the front with the Chihuahuas Crossbones logo on the left sleeve. The black and pinstripe alternate jerseys also feature the wordmark across the chest. 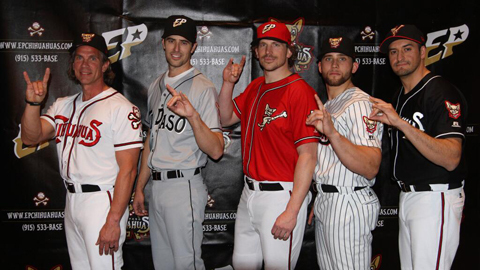 The gray jersey, or road jersey, showcases the El Paso wordmark logo with the Chihuahuas Head logo on the left sleeve. The red alternate jersey features the Swinging Chihuahua logo on the left chest, paying homage to the team's Major League affiliate, the San Diego Padres.